Marla Streb at CORBA's Fat Tire Fest, Saturday, October 14th. Mountain bike legend Marla Streb will lead a skills clinic and ride at this year's Fat Tire Fest! We were all disappointed last year, when Marla had to cancel due to a family emergency. This year Marla will be traveling to the FTF wth her husband and new baby. CORBA is also pleased that local cross-country racer Mikel Aucutt, who placed Second in the Expert Masters this year, will be working with Marla on the clinic and ride. Mark your calendar as it's barely a month away. CORBA's Fat Tire Fest, Saturday, October 14, 2006 at Malibu Creek State Park. This event celebrates CORBA's 19th birthday and includes the popular Poker Ride. Companies such as Giant, REI, and KHS have donated great bikes and other great goodies for the FTF raffle. Sign up early and get free raffle tickets. You can use Active.com, PayPal, and snail mail (to be posted soon). The Fat Tire Fest is lots of fun, but it's also fun work for some. We could use help before and during the event. If you would like to lend a hand, please contact Louisa at 310-374-7552 or mtbike4@earthlink.net for more information. Saturday, September 30th: CORBA Trail Work Day on the Ken Burton Trail. The Ken Burton Trail is located in the Angeles National Forest near Brown Mountain. This trail has pretty much been taking back by nature and we need to reclaim it. We will need a large crew out on this one as there is a lot to do. Please mark your calendars and bring a friend or two. Meet in the Millard Canyon Campground parking lot at 7:45 am. We will carpool up the Brown Mountain Road to the top where the Burton trail is located. We could use a few trucks or SUV's to shuttle everyone to the top. If you would like to help with your vehicle that would be great. Send Hans, hans@corbamtb.com an email to let him know. Directions: Off the 210 Freeway, exit Lincoln Ave.,in Pasadena. Head north 2 miles, turn right on Loma Alta Drive; flashing yellow light is Chaney Trail, go left and follow the road approximately 1.5 miles to the end at Millard Campground parking lot. CORBA Trail Crew Page. 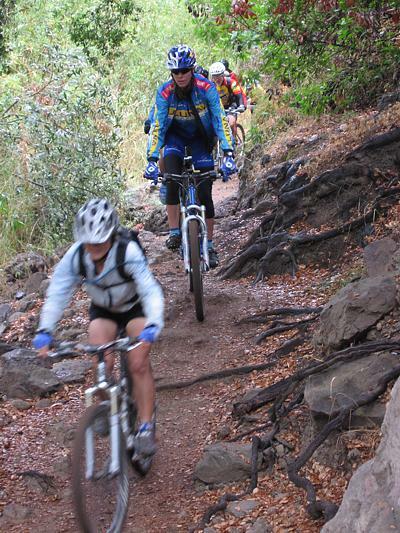 If you want to ride your bike to the top, plan to arrive at the Ken Burton trailhead at 8:30 am. It is about a 1-hour bike ride to the top from Millard Campground. Local clothing manufacturer Evomo has extended a discount to CORBA members. Check out Evomo's unique mountain bike-specific designs at www.evomo.com. Enter Code CORBATRAILS10 to get a 10% discount. Evomo is also a sponsor for Mikel Aucutt (above). See the Art of Tommy Hollenstein. Presenting "Wheels of Dreams" September 5 - 29 with Artists' Receptions on Saturday, Sept. 9th, 7-12pm and Thursday, Sept. 14th, 6-10pm. Where: Infusion Gallery, 719 South Spring Street, Los Angeles, CA 90014. Former mountain biker and surfer, Mr. Hollenstein paints using his wheelchair tire tread. "Tommy's art is exciting, full of life and inspiration." www.tommyhollenstein.com. Please send comments or submissions to info@corbamtb.com. You are receiving this because of a current or past membership in the Concerned Off-road Bicyclists Association. To unsubscribe reply with a note to that effect. Sorry for any inconvenience.